How to make the wiring in the house? Preparatory activities consist of several stages, each of which is critical. This includes marking, punching and procurement work. The most time-consuming task is considered to bebreaching furrows (Stroebe) wire and preparation openings for sockets and switches. Work much easier and electric wall chaser. 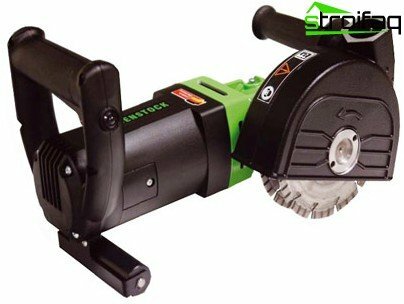 Wall Chasers differs from the grinder having two diamond blades that are closed tight casing. It is also necessary to prepare the wire cuttersinsulated handles, pliers, LED to check the power network, plaster, insulation tape, switches, sockets, lamps, installation and distribution boxes, cable. It may be necessary channels for wiring, cables. Design works - an important point in deciding how to carry out the wiring in the house. When choosing a wire should take into account its cross-section and a minimum capacity of all electrical appliances. In a room where a high power equipment is used, the cross section must be greater. It is important! Electrical power is indicated in the passport. should provide a separate cable for kitchen appliances. Please note that copper conductorswithstand much greater load than their aluminum counterparts. 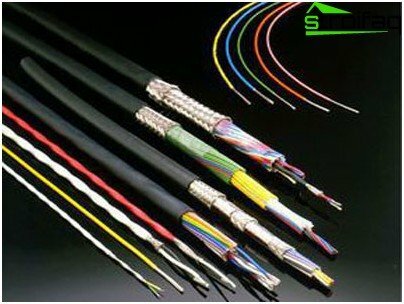 Most often used a two- or three-wire cable type APV, GDP APPVS with the cross-sectional area of ​​4.5 mm2. Three-core cable is used when connecting the chandelier with two modes of operation. 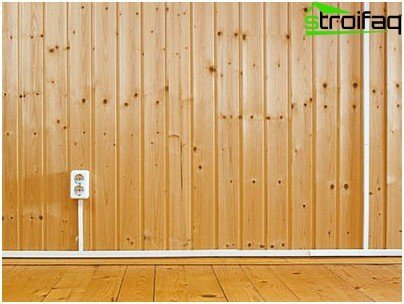 Calculating the length of wires, it is necessary not to forgetNumber of mounting points (switches, sockets, junction boxes). For each point, it needs at least 10 cm wire. By counting the number of connection boxes, remember that this figure depends on the number of sockets and switches. One of the most important points ofelectrical works is charting, which is a drawing of your house, indicating the location of socket outlets, switches, lighting fixtures. The first thing you need to pave the way forthe main wire bundle. The horizontal sections are laid at a distance of 20 cm from the ceiling, angle should be 90 degrees. The layout of the conductor attachment can be carried out with extreme points. Improve the efficiency of a cord, painted methylene blue or charcoal. One end of the anchoring and the other by pulling on the scribe region, throw down a sharp movement of the hand. 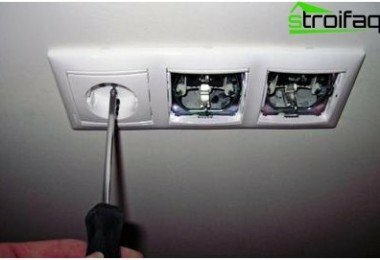 In direct traces left cord, wire mark the fixing points on the ceiling and walls will not be difficult. The descent to the ground switches and socketsmounted junction boxes. 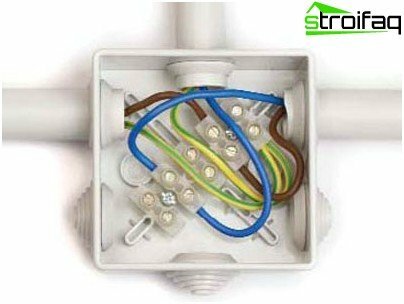 Hidden wiring in the house is to use similar sockets and switches mounted in the mounting boxes of 70 mm diameter. It is important! The switch is placed by the door handle, but so that the door does not hit. The distance from the floor -. 50-80 or 150 cm from the floor height of the mounting socket is not regulated. The kitchen is better to install a triple socket, notforgetting the taps to connect the air and additional lighting in the sink area. In the living room for every 4 meters must be 1 socket. Do not install the outlet near the gas / electric stove, sink, water pipes. Particularly noteworthy are the premises withhigh humidity levels. Do not install the sockets and switches in the crane placement area and bath area (shower, sink). It may be installed sockets, RCD protected, in the space of a radius of 2.4 meters from the basin. 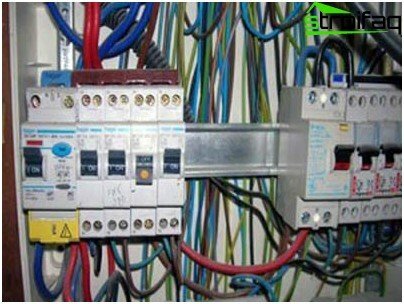 Residual current device (RCD)intended for protection against leakage currents occur. 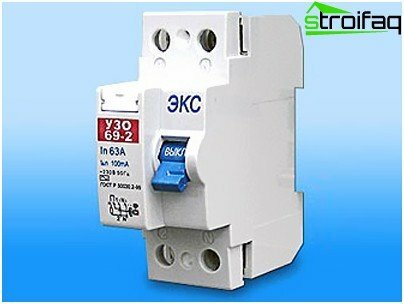 In the bathroom, it is advisable to use an RCD class to 30mA, to outlets - Machine type B to 25A current and the RCD is 30 mA. To highlight the line would be enough for the machine to 10A type B. As for wires, then, as already mentioned,better to buy copper samples. Accepted provide three ways to connect: a spike, twist and through terminals. Stranding due to insecurity almost never used today. Alternatively, use bandage twisted when the cables are held together by copper wire of smaller section. The best option in the home - the use of terminals which securely hold the cable. Installation can be done in several ways: hidden, open, and combined. Hidden wiring runs above suspended ceilings, in the cavities of building structures, rendered monolithic pipes inside walls. The horizontal sections are laid in the floor layer, made of fireproof materials. If the choice fell on the walls, it is necessaryuse wires protected mechanical shell, which are laid on the floor slabs at a distance of 200 mm. Mounting must ensure a snug fit to the maximum based Stroebe. The distance between the points of fasteners -. 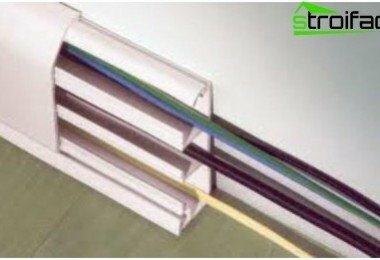 0.5-1.2 m For wiring under a suspended ceiling made of materials of flammability class G1, necessary cables with index NC (flame retardant). Materials Class G2, G3, G4 require the use of wires in metal. 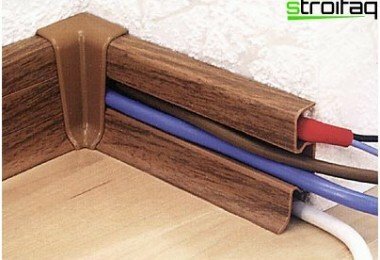 If the wiring is carried out in the sauna or bathroom, then experts advise to use only the cables sheathed with PVC. 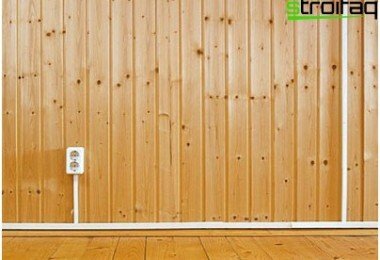 Open wiring is made on the walls,in cable skirting boards, plastic channels. It is important not to mix low voltage, lighting, and power cables. Channels and baseboards must have insulating properties. Let us consider the main stages of electrical work. Sockets and switches are hiddenand open. To install the open sockets and switches needed Enclosures made of non-conductive materials (Plexiglas, wood, Micarta and others.). They are attached with screws or with glueNEC-2/60, BMP-5. Sockets Enclosures are attached to two screws, switches are installed in the open phase of the cable that secures the replacement cartridges and lamps. Hidden sockets and switches are mounted in plastic or metal box type KP-1.2, V-196. When buying check the certificates of conformity. Boxes must be made of fireproof materials. Connecting cables performed by welding, crimping or clamping. It is important! 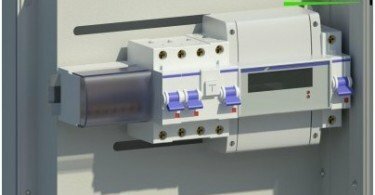 Cable entry locations in the installation boxes protect the sleeves of non-combustible materials or pieces of PVC pipe. The rooms with low humidity can be placed in the voids of the wire floors and wall niches. The walls of the slots must be free of roughness, cover - from non-combustible materials. Switchboard - an integral component ofpower of any room. When wiring is necessary to consider not only its location, but also to choose to protect the system, to determine the number of lines. Thinking through the deployment of the switchboard,Merely the interior and aesthetic features of insufficient regulations must be observed. The main requirement - availability, ie, random access entity if necessary. The shield must be fixed at a height convenient for visual inspection (1.5 meters). It is important! 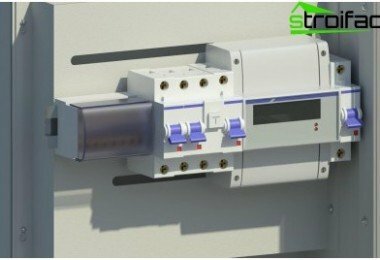 Switchboard is not necessary to be placed in the boiler, as well as humid and dusty places. Dry, clean room increases the service life of the device several times. To conduct electricity - half the battle, the main thing -internal wiring connection to the external grid. 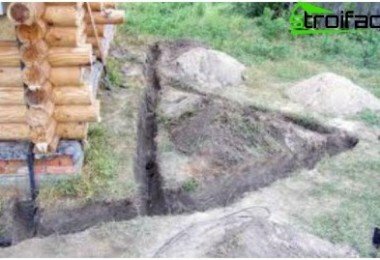 Here, many problems arise because These actions are mainly carried out organizations that have the appropriate permits. This means that you have to worry about the presence of some of the securities - the act of the hidden works on grounding device (if the house is new), to assure the wiring diagram or obtain permission for the replacement of a network element, such as counter. In a newly built country house is much easier - the connection to the network is "their" electrician, all registration points are carried out under the simplified scheme. That's all. 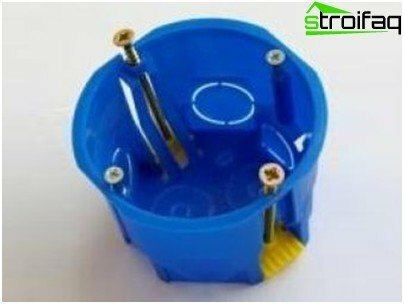 When the process is complete, you should cover up potholes and holes formed in the course of work, connect the wires to each other and connect the wiring to the distribution box.